Buses come and buses go. Usually once every hour or more often. Bus lines also come and go, but with a much lower frequency. The route of several bus lines in our country has been virtually unchanged for nearly a century, even if the mode sometimes changed from horse tram, via electric or steam tram to bus. Whenever a bus line changes, the road is usually still open to cars, so that part of the infrastructure sees no change. Bus stops however, have few other uses than, well, being a place for people to wait and buses to stop. It’s hard life to find a new job as a bus stop whenever they are abandoned by their buses, and even harder for them to overcome the loss of being a stopping place, while their former friends the buses taunt them by passing every now and then but not taking up any new passengers. The title of this post is a play on the company that runs buses in this area, Connexxion. Although even that is not a certain given; it’s concession ends in december 2016 and another company could take over operations here. 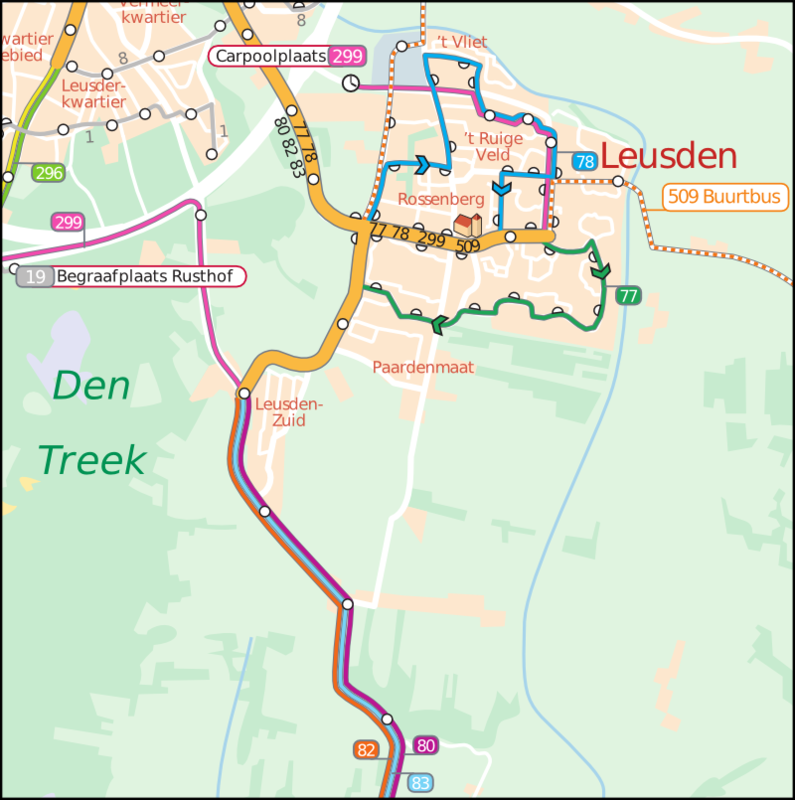 The first set of bus stops that got this type of abuse is the former P+R Leusden Zuid bus stop pair, at the intersection of the Arnhemseweg and the Stichtse Rotonde. While bus line 299 hasn’t halted here since December 13th, 2013, it passes here 7 times per weekday. The bus stops are marked as being “permanently lifted”, even though they still have the official bus stop sign and even a timetable. The accompanying Park and Ride parking has been removed; it’s still visible on Google Earth (see below). It might be possible that this bus stop pair will be reopened for passengers for half a year from dec 2014 till june 2015 (Ironically, this is the ultimate responsibility of this blog’s writer, as he works at Connexxion and is the one who decides where bus lines go in this region) as buses will change routes temporarily until the “Kersenbaan” project starts. 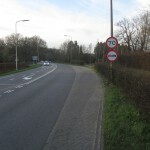 The bus stop towards Leusden. Interestingly enough, while the stop is unused since december 15th, 2013, pylons closing it appeared in the two weeks before my March 20 visit, as I visited this stop before on March 7th, and it was still open to traffic then. “Bus stop permanently closed since 15-12-2013”. However, it still has an official bus stop sign and a timetable. Currently the 299 bus passes here 7 times a day, but never stops. The walking path to the former Park & Ride parking. 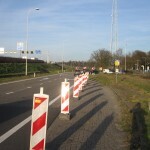 The stop towards Utrecht. A bus stop sign is still visible. The small yellow sign on the lamp post shows that 299 buses should turn left here. 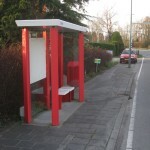 The next bus stop pair, Schutterhoeflaan, is out of use for much longer. Even though bus line 299 passes here, the bus stop was probably put to sleep long before the 299 started, and last saw a bus 80 on it’s old route. The southward bus stop has been repurposed as an unmarked parking, but the northernmost has been closed off by little posts so no one will stop here. Both still have a small platform, but that’s it. 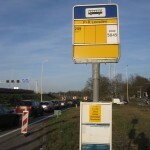 The Schutterhoeflaan bus stop towards Amersfoort. It’s sister at least now serves as a parking, this one is locked up so no car nor bus will ever stop here. The platform is still visible. 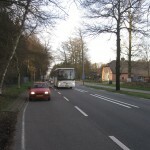 The Schutterhoeflaan bus stop, together with a 299 express bus, which never stopped here. 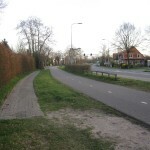 Further south, where the Maanweg intersects the Arnhemseweg, is the Bavoort bus stop pair. This one is a strange leftover from times gone past, as there is another Bavoort bus stop about 200m to the northeast. Bus lines 80, 82, and 83 do pass the southern of the old Bavoort stops, while 299 cruises past her barren northern sister. The southern stop still has a platform and a shelter, the only one in this series. The northern stop has an overgrown platform, and a little sidewalk leading close to the stop. Close, but not exactly. If you want to get here, you still have to cross about 1 metre of grass, which looks like this frequently happens. 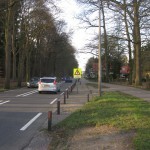 This bus stop pair will too be reused when the Maanweg will be closed off, in december 2014. 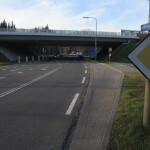 At that moment, the old Bavoort bus stop will be reused, by lines 82 and 83, and the current Bavoort stops will be a citrastructuræ. 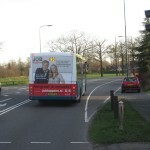 This bus just halted at the current “Bavoort” bus stop and now passes the former. In December 14th, 2014 this bus stop will be reopened. 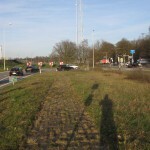 The former bus stop towards Amersfoort had a path to it. Except that the path didn’t fully connect to the bus stop. Is this a citrastructuræ leading to a citrastructuræ? 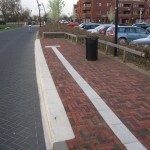 The next bus stop pair in this area is the Maximaplein in the Tabaksteeg neighbourhood. Like the old Bavoort, this is a future-ex-citrastructuræ (aka infrastructuræ), but it has never seen a bus pass. The bus stop was erected somewhere in the early 2010’s and will be frequented by the 80 bus line from December 2014 on. It still needs stop signs and shelters though. The short stretch of street is reserved for bus traffic only, making it a true ghost stop at a ghost street – unless everyone just ignores the prohibition and uses this street as if it were open to the public. 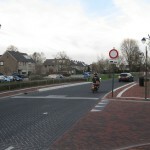 Future status: Bavoort and Maximaplein will be put (back) into use in December 2014. The long-term future of Schutterhoeflaan and P+R Leusden Zuid is more uncertain, although the latter will see temporary use for the first half of 2015.